Okay here we go, a game jam for the working crowd. During the time of June 4, 5, 11, 12, 18, and 19, you gotta make a game. 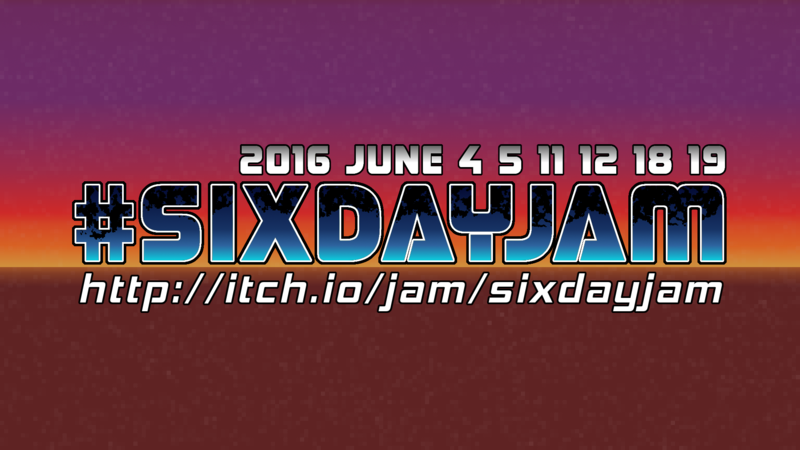 If you don't have those weekends free, you can take any six days within the jam timeframe to complete your entry. Individual developments are encouraged, team developments are welcome. Screen-casting your development time would be an awesome contribution to the indie community! We're all here to have fun, and make some cool and fun games. Let's DO THIS! *You can use a game engine like Unity or whatever you want, as long as it is publicly and freely available for anyone to use before the start of the jam. If you've built your own game engine, that's great! Now make it freely available for anyone who wants to use if for this jam, and you can use it yourself. ** You really should license the source code for your entry as open-source. This is to give back to the indie game dev community, and to help educate new devs on how we get things done! There is nothing wrong with continuing your entry after the jam and not releasing the continued source as open-source, and you do not need to open-source any of the game's resources (images, sounds, music, etc...) if you don't want to. Disclaimer: This is the first jam I've hosted, so hopefully you enjoy yourselves, and we can do this again!